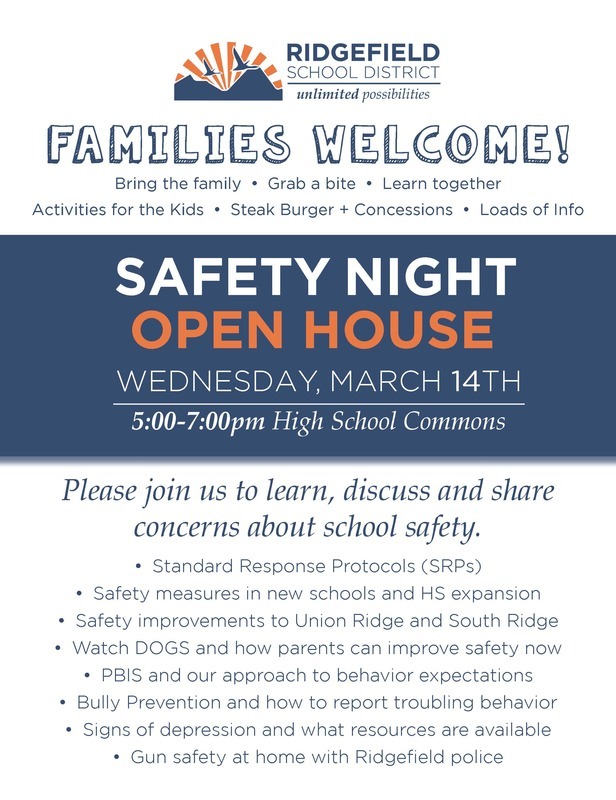 Ridgefield School District will be hosting a Safety Night Open House on Wednesday, March 14 from 5:00-7:00 pm at the Ridgefield High School Commons. The goal of the family-friendly community event is to share important district information regarding school safety and to engage the community in working together with the district to ensure safe learning environments for all Ridgefield schools. Attendees can arrive at any time during the event and visit various stations staffed by experts in their field who will provide information and answer questions on topics such as emergency response protocols, bullying prevention, safety/security improvements and recommendations in the 2017 Bond Program, gun safety, mental health, and social media safety. Participants will also learn more about programs now used in the schools such as SRP (Standard Response Protocol), RSD Safe Spaces, Second Steps anti-bullying program, and Positive Behavior Intervention Supports (PBIS). District and school personnel will be on hand at the various information stations along with representatives from the Ridgefield Police Department, R&C Management Group, and Community Services Northwest.